It was at the beginning of the reign of Queen Victoria that the Staffordshire potters first produced their characteristic portrait pottery. The young Queen and her family inspired enough pottery models to suggest an important collection in themselves. It is clear that these pieces originated in diverse factories although it is proving difficult to pinpoint the whereabouts of manufacture. There are no trademarks to guide us, nor are there old catalogues nor appropriate advertisements extant. A collector will recognise affinities in manufacture and can group the figures accordingly, but only two or three factories have been traced with any certainty. However, we hope to show that perhaps a more important way of classifying the portrait figures is to group them chronologically and by profession. 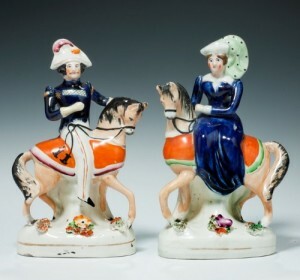 Many of the pieces which we can attribute to the 1840’s show a porcelainous character. They tend to be smaller and more highly coloured than the later ones and are sometimes made in the round. In fact, it is not until a decade later that we consistently find the characteristic flat-back earthenware. The 1850’s were the halcyon days for the potter and his customers, and Crimean time pottery is Victorian Staffordshire pottery at its finest. The Queen comes first in time and importance in the royal list. A model labelled “Victoria,” in the possession of Mr. R. Shockledge, in which she holds orb and sceptre, might well have been made at the time of her coronation. Very soon, and romantically, appear portraits of Prince Albert as well. Both the Queen and her husband occur in numerous forms : standing, sitting, enthroned and also mounted on horseback. Frequently, these pieces were not labelled, but where they are named the inscription is usually ” Queen ” and ” Albert ” or, very rarely, ” Queen Victoria ” and Prince Albert.” We do not know of any piece entitled “Prince Consort ” and if any were made at the time of his death they needed no label. A large model of the Queen, made about 1870 and paired with the Prince of Wales, has the inscription ” Queen of England.” This model was used again, with a fuller inscription, both at her Jubilee in 1887 and her Diamond Jubilee ten years later. The figure became progressively debased in form. As the children arrived the potters became busier than ever. Charming pieces show the Queen seated, both with Prince Albert and alone, holding the infant Princess Royal in her arms. A tiny crown appears on the child’s long clothes. The pieces portraying the royal parents and children mount up like the photographs in a family album. Over and over again the little Princess Royal and Prince of Wales appear, separately with their toys and also playing together in their pony carriage or in one of their fancy boats. Pairs show them riding their goats and their ponies. It was some time before we could recognise these royal children apart and then we realized, of course, that although he too wears a skirt the little Prince always bestrides his steed whilst his royal sister rides side-saddle. From one factory comes a delightful series of the Queen and her husband at play with their children, even teaching them to ride. The royal residences are represented in this portrait cavalcade by Balmoral and Windsor Castle. As the children grow older the Prince of Wales becomes the favourite and there are figures showing him at every stage. Sometimes he is paired with his younger brother, Prince Alfred the sailor. A fine piece, which must have been made about the time of their betrothal in 1858, shows the Princess Royal and Prince Frederick William of Prussia together; and a handsome equestrian pair was made on their marriage. Then come numerous groups and pairs entitled ” Prince and Princess : ” the Prince of Wales and his bride to be, Princess Alexandra. There is a rare and very fine pair, presumably dating from their marriage in the early seventies, of Prince Alfred the first Duke of Edinburgh and the Czar’s only daughter. Most of the sons and daughters of the Queen, and their wives and husbands, are known to have been portrayed. Nor were the heads of foreign royal houses forgotten. At the time we started our collection we found just one figure of a living member of the royal family: Queen Mary shown as ” Princess May,” at the time of her betrothal to the Duke of Clarence of whom a figure also was made. The lively market for royal figures did not exclude numerous other persons from the potters’ lists. Popular politicians were in demand and it is not surprising demand and it is not surprising that numerous figures were made of Peel and Cobden, probably in 1846 at the time of the repeal of the Corn Laws. In fact, a standing figure of Peel has an additional figure of Peel has an additional inscription ” Repeal of the Corn Law.” A seated figure of Cobden shows him with sheaf of corn and orator’s scroll and there is a splendid equestrian figure of Sir Robert Peel made at the time of his death in 1850. A still rarer figure of Peel has his name inscribed on the pillar and an unusual circular base. Pictured right: Staffordshire Pottery figure of Richard Cobden MP (1804-1865). Full-length Staffordshire figure of Richard Cobden, standing, bare-headed. Right hand on his hip, left holding a paper against his leg; a pedestal behind it. (1804-52) M.P. 1841-65. He and John Bright were the principal agitators for the repeal of the Corn Laws. Image part of the National Trust Inventory Number 709134. Visit http://www.nationaltrustimages.org.uk/ for more details. There are at least eleven different models of the national hero, Wellington. They show him first as a soldier, then as an elder statesmen and, finally, there is a memorial piece. As time went on Gladstone moved into position of greatest demand and appears in numerous models. A fine one of the 1870s, shows him paired with Beacons- field. We would suggest that a very late and very poor cast, pair of Mr. Gladstone and Mrs. Gladstone may have been produced in 1898 at the time of his death. The Irishmen whom we would expect to appear, do so: O’Brien, O’Connell and Parnell. However, in this and other series, there are gaps in the popular ranks which puzzle the collector but which also give him the exciting hope that one day he will come across the missing persons. The nineteenth century was the age of inspired religious leaders. The politicians, as we have seen, stand for the most part on the left ; these great preachers are generally to be found among the ranks of the Non-Conformits. 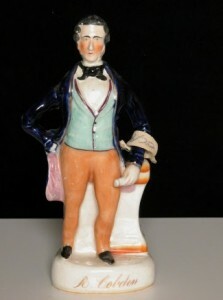 Pictured left: Staffordshire Pottery figure of Dr Thomas Raffles (1788-1863). 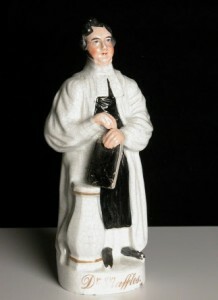 Full-length Staffordshire figure of Dr. Thomas Raffles, standing, bare-headed, in bands, cassock and gown. Image part of the National Trust Inventory Number 709195. Visit http://www.nationaltrustimages.org.uk/ for more details. Figures of Wesley were made some time after his death, as was one of the one-eyed Welsh preacher, Christmas Evans. This figure was probably made about the same time as a very rare one of the Welsh Calvinist Methodist, John Elias, who died in 1841. They are impressive, finely modelled figures, 14 inches high and outstanding in glowing black coats. A smaller figure of unrelieved black shows a portly parson labelled J. Bryan, thought to represent the founder of the Bible Christians. An excellent an important fact for collectors to bear in mind, namely, that the same figure may occur both named and unnamed. Any figure of Dr. Raffles is uncommon but a named one at present is unique. 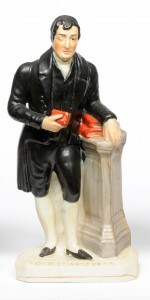 Pictured right: A Staffordshire Pottery Figure of the Rev Christmas Evans, 19th century, wearing black jacket and breeches, holding a book in his right hand, leaning on books on a column, on a titled base, 33.5cm high. Sold for £450 at Tennants, July 2010. Image Copyright Tennants. Spurgeon, Wesley and Cooke are shown in pulpit settings. The American revivalists and hymn writers, Moody and Sankey, must have been very popular in the early 1 870’s for there are fine standing pairs made of them in as many as four heights. It had become standard practice to re- peat popular figures in several sizes. A few uncommon pieces of the early 1850’s show the anti-catholic feeling of the time by attempting to display the evils of Popery and the virtues of Protestantism. It may be that the models of the Oxford martyrs were made at this time; they appear to come out of the same factory. 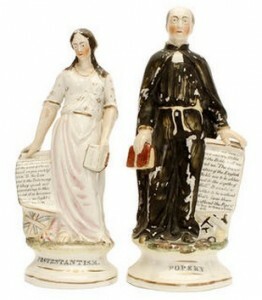 Pictured left: A pair of Staffordshire figures, ‘Popery’ and ‘Protestantism’, mid 19th century in the form of male and female figures, standing and holding bibles. Sold for £312 at Bonhams, Oxford, July 2013. Image Copyright Bonhams. In spite of the leaning towards Protestantism some Roman Catholic pieces were made, for we have found both pottery crucifixes and stoups. There is also a magnificent and monumental portrait pair, 18 inches in height, of Pope Pius IX and the popular Cardinal Manning. 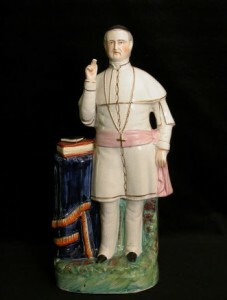 Pictured right: Staffordshire Pottery figure of Pope Pius IX (Giovanni Maria Mastai-Ferretti) (1792-1878) c1870. Full-length Staffordshire figure of Pope Pius IX, standing, in skull-cap, knee-length coat and trousers. Image part of the National Trust Inventory Number 341439. Visit http://www.nationaltrustimages.org.uk/ for more details. Decorative figures of bible stories are to be found and references to them will be made under a later head. Here it must suffice to have referred only to three great portrait groups. There are more to follow; wars, sport. entertainment and even crime are all recorded in this bold pottery. The collector walks in history. In short, the potter of Victorian times occupied the position of the newspaper caricaturist of today. He seized upon any national event and recorded it in his plastic clay for posterity. Fortunately for us his art has proved often surprisingly endurable. Countless pieces must have been broken but enough remains for us to obtain a vivid coloured picture of his life and times. His contribution to social study is therefore considerable.